BMW sedans have traditionally been incredibly well handling solidly built machines, that is until they started becoming over-complicated to the point that today they have terrible depreciation and a whole cadre of esoteric electronic devices to fail at any moment. Back when they sold a product that was designed to last for longer than the 3-year initial lease period, the E3 New Six Bavaria was the top of the heap for roomy yet capable sedans offered in the US. It featured a torquey 3.0L inline six-cylinder powerplant, a 4-spd manual trans, 4-wheel independent suspension and sharky good looks. 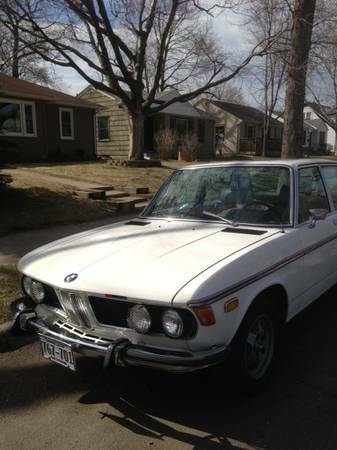 Get yourself into a big open greenhouse and buy this 1973 BMW Bavaria light project car available on craigslist in Cedar Lake, MN for only $2900.